I think I’ve mentioned it before, and I’ll say it again, eggs are my favorite. If prince charming came along one day he need only bring a carton of eggs to make me swoon (ok, that might be a slight exaggeration but you get my drift…) I think their versatility and ability to play well with others is one of the eggs best attributes. Heck, it even gets along with oddball fenugreek – who knew! 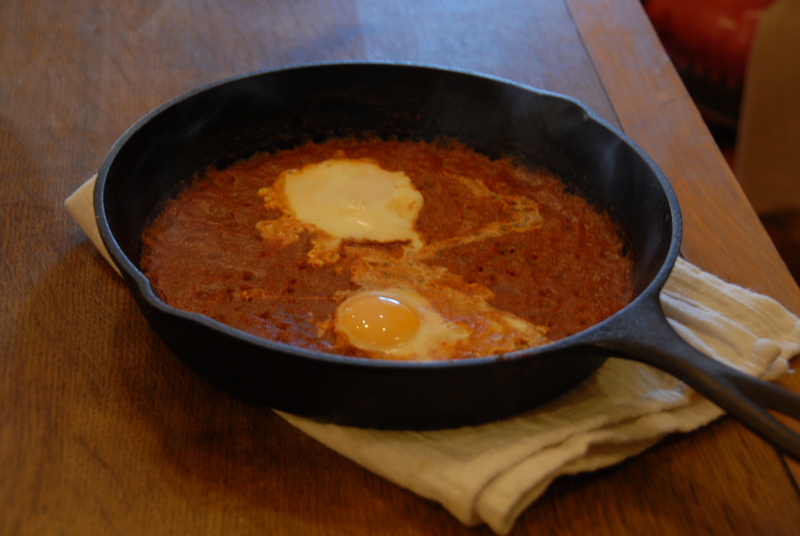 I love baked eggs in a rich tomato sauce – easy and delicious. I read through a good deal of tomato chutney and salsa recipes that used this mysterious fenugreek and was excited to give one a try – the only thing – so many of the recipes also had various other obscure spices I would have to buy. So, instead of choosing just one, I took my favorite parts of about three recipes and crossed my fingers that it would turn out ok. You know what – it came out better than OK! The sauce preparation couldn’t be simpler. 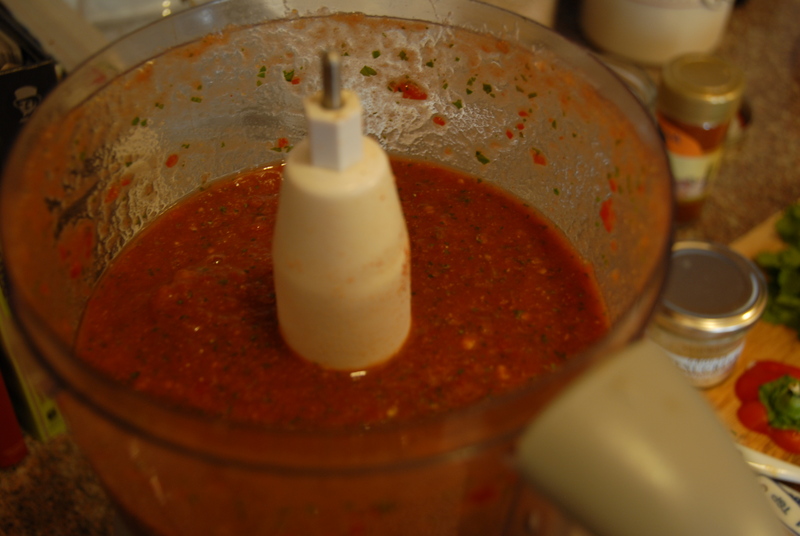 Put the garlic, tomatoes, pepper, herbs and spices in a food processor. Pulse a number of times until it’s reached your desired consistency. Taste, check for seasoning, add more as necessary, blend again, and voila! Sauce! For the baked eggs: Preheat the oven to 350 degrees. Put a cup or so of sauce in an oven proof saucepan (cast iron works great). On medium/high heat cook down until the sauce becomes thick (2-3 minutes). Make a small indent or well where the eggs will go and carefully crack them into place. Place the saucepan in the oven for 3-5 minutes. When the whites of the eggs are set remove and enjoy. Be sure to have some good bread around to sop up the extra sauce. What’s even better – this simple sauce makes enough for a few meals. 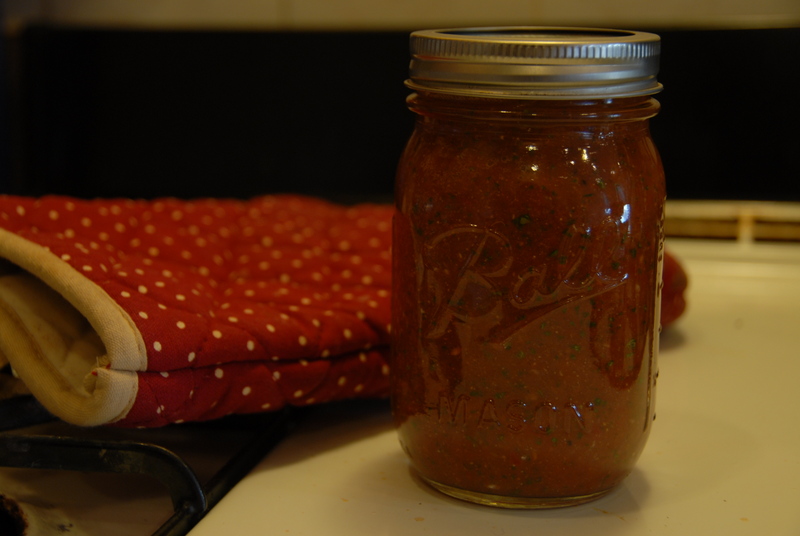 I fully intend to put this fresh and spicy sauce on fish, pasta and of course, some more eggs. This entry was posted in Eggs, Fenugreek, Tomatoes and tagged basil, cilantro, easy, eggs, fenugreek, garlic, tomato sauce. Bookmark the permalink.